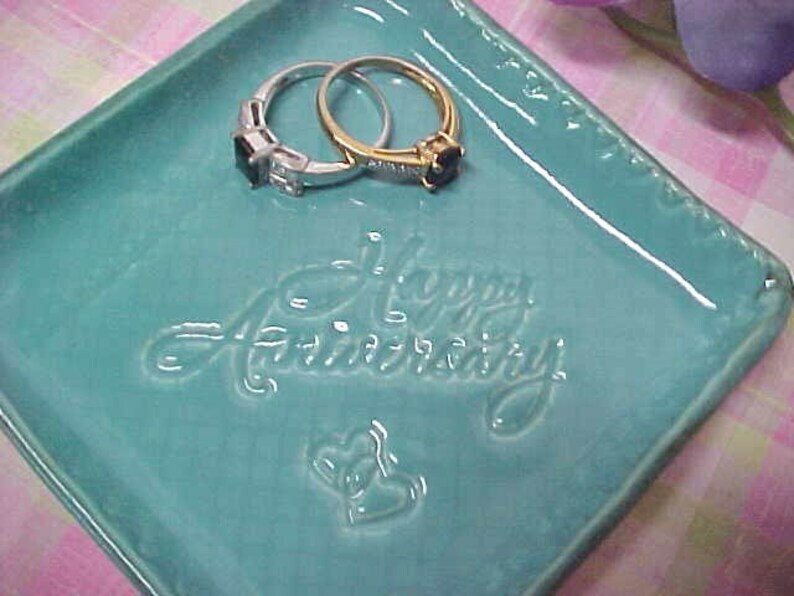 I handcrafted this beautiful Turquoise Pottery Trinket Dish & stamped it with 'Happy Anniversary' & Entwined Hearts design. 🎀 SIZE: It is almost 4 inches square and fired in my pottery kiln. Has nice cork pads on bottom. This will make a lovely romantic gift for your Anniversary, especially the 8th, 9th, 18th- Porcelain! (I found those years by researching!) It will be handy to hold rings, jewelry, coins, potpourri, etc. Ready to Mail when you purchase! And If you like, I can also add a short message in the package. Just type in the Note to Seller on the Checkout page. To see more lovely pottery I make, please enter here.